News / Transport / Should the Mernda rail extension project result in more intensive land uses? Should the Mernda rail extension project result in more intensive land uses? All three major political parties are now committed to extending the South Morang (née Epping) line to Mernda. With commitments from the Liberals, the ALP and the Greens, focus will now shift to cost and whether or not a re-elected Napthine Government or new incoming Government actually gets on with the job. While perusing the City of Whittlesea's website in the days after the final commitment was made by the Liberal party, I stumbled upon the master plan diagrams for the Mernda Town Centre. Originally approved in 2009 with amendments made in 2012, one map which caught my interest was the indicative land use diagram as shown below. Mernda Town Centre Comprehensive Development, page 48. As you can see from the map, high-density housing doesn't feature all that heavily except directly adjacent to the transport interchange, which one would assume is where the new Mernda station will be built. Lower densities dominate the comprehensive development plan with many typically suburban aspects featuring in the document. But is it right to build infrastructure designed to carry mass amounts of people with a same-same attitude to how the area will be developed over time? Granted there has been a long-fought community campaign to have the Epping Line extended to South Morang and then even further along the former Whittlesea rail line. The congestion in the area has had noteworthy media coverage, but perhaps that is more a fault of the improper road design and lack of the simplest and cheapest public transport mode (buses) being rolled out over the course of the region's development. That said, something is happening, however given the rail extension will enter an area with relatively low land prices (as compared to Northcote, Collingwood or Clifton Hill on the same train line) isn't this the perfect opportunity to turn fringe design on its head? Take St. Germain Village, a new development planned in the City of Casey. This greenfields site is turning suburban design on its head; a diverse range of housing densities (well much more than the strip of high-density marked in the Mernda Town Centre plan) with integrated health, commercial and retail precincts. As we reported on back in October, the tide looks to be turning for suburban design. 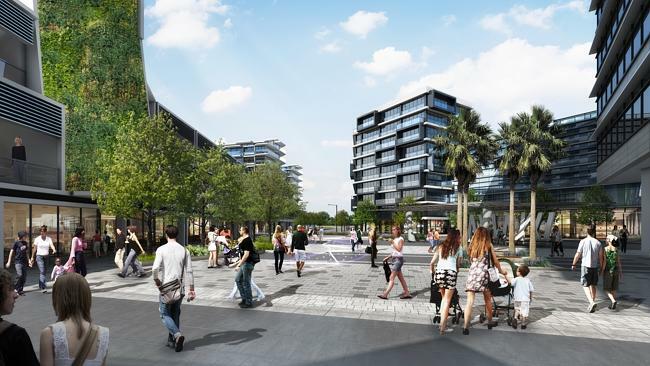 St. Germain Village is going all-out with no new rail line being built into the precinct and the Mernda Town Centre plan appears to be quite "business-as-usual". I can't help but feel the wrong message is being sent in this instance. Should rail line extensions come with increased land use intensity trade-offs? Yes, but will Melbourne deliver? Had to laugh at the "née Epping" bit too. I'm sure it was "née" the 'Preston Reservoir' line but later became the Whittlesea line, though if you are talking suburban electric service, it has been the Reservoir line, the Keonpark (sic) line, the Thomastown line, the Lalor line and the Epping line as well as the South Morang line. It should in my not so humble view be called the Merri and Plenty Valleys line, hich is what it actually is. A bit of a mouthful, though scenic sounding. Which it certainly will be beyond South Morang provided they don't dig it into a single giant trench like they have to South Morang. I'm not talking definitively here at all but Mernda and any intervening stations should obviously (but unfortunately still only hopefully) have medium density development attached better than most stations in Melbourne. The real opportunities for bigger higher density centres are the existing stations along the line - reservoir after a grade separation, epping by converting crappy retail and better connect to the plaza and hospital, south morang and the Westfield, even thomastown has a decent shopping strip with room to do high density without offending the locals. Realistically these are better chances with bigger catchments and more existing jobs and (very minor) local service provision to build off. Also better/ more logical connections to the universities on plenty road.